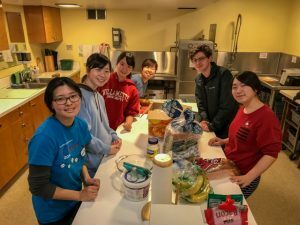 The Willamette University ‘Take a Break’ program recent visit to Seattle focused their Spring Break program on issues of homelessness in our NW region. Students shared that they too see the challenges in their school town of Salem, Oregon. Having the opportunity to immerse themselves in the topic though was eye-opening and enlightening. Once the students settled in, they were invited to engage shelter residents at Maple Leaf Lutheran. Shower schedules, sleep schedules and meal schedules all had to happen together. Students chose to ‘share’ a meal in their week in Seattle with the residents at the coed shelter. Spaghetti? A familiar and often served choice that the residents see at some of the feeding programs downtown. Easy and filling. The students thought outside the box. How about breakfast for dinner!? Never done that but was a big hit with the residents and appreciated. Residents enjoyed the meal-time and the students sat down with them to share a meal and engage. Thank you, Bearcats!